1951 Ford F7 owned by Keith Seafield from Cooper City, Fla. This unit has a custom body by Schukraft Body Builders of Chicago. The body is framed in wood as well as the three doors. It is powered by the original 337hp Lincoln engine with a 5 speed manual transmission(unsynchronized). This was one of the final vehicles to serve the Chicago Fire Patrol which began in 1871 an ended in 1959. 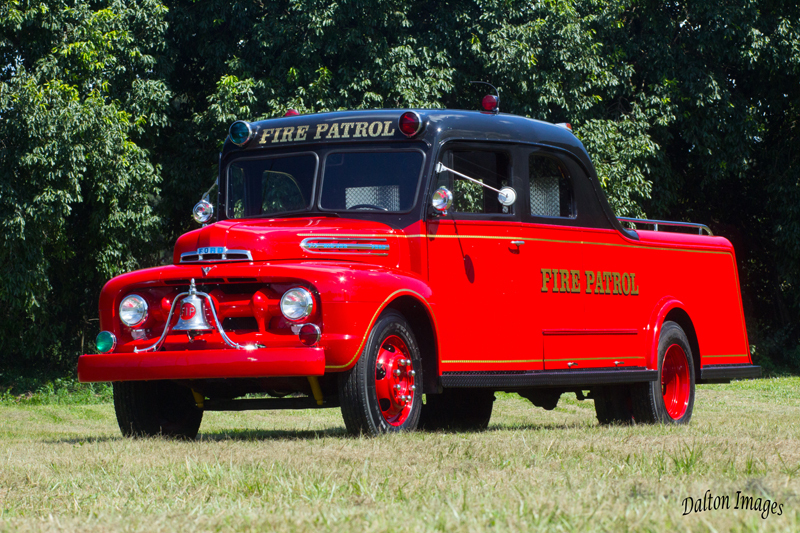 This unit operated as Fire Patrol #5 from 1951-1959 and was used by his grandfather, Captain Michael Kinsch (retired as a Battalion Chief) when he was a member of the CFP. FABB Apparatus Collector Cards Available, 17 cards per set. The Leaky Bucket is the official publication of the Florida Antique Bucket Brigade and is published quarterly. It is sent to each member of the Association. Viewers and members can submit pictures, articles, ads (reviewed, of course) to the editor of the Leaky Bucket, at leakybucket@fabbfire.org. The Florida Antique Bucket Brigade or FABB as we call it, is a statewide group of firefighting Apparatus, tradition and history enthusiasts who love to get together and talk fire apparatus. Not only do we talk but many members own their own fire apparatus spanning in era from the early hand drawn days to fire apparatus that could still serve a small fire department today . We restore these items to parade, show, pump, and compete in many types of public activities each year. They have even appeared in major motion pictures. But our favorite activity is the Fire Muster which has become a celebration of firefighting, it's apparatus, history and tradition. Many of our members collect fire memorabilia, model fire apparatus, extinguishers, badges, patches, firefighting photography, and just about anything connected with firefighting. Anyone who is interested in firefighting apparatus and history may join us. We also have Florida fire departments and museums owning historically significant apparatus as members, but you do not have to own apparatus to join. Our members come from all walks of life. The Florida Antique Bucket Brigade is one of many regional chapters of "The Society for the Preservation and Appreciation of Antique Motor Fire Apparatus in America," or SPAAMFAA, which is an educational and historical society founded in 1958. FABB, which was organized and chartered in 1977, brings activities represented by SPAAMFAA to the state and local level. We also promote local fire history and fire museums by displaying historically significant club owned fire antiques. FABB is a registered non-profit organization. We are here to enjoy our hobby and help others appreciate it. Take a moment to Email us your name and address for an application or print the application form now, fill it out and send it in. Help us preserve and enjoy the history, tradition and hardware of American Firefighting. The application is in Adobe Acrobat format. If Acrobat Reader is not installed in your computer you can get a free copy of it by clicking here.